If your anything like us, a nice craft beer after a long day of wine tasting is the perfect way to end the day. And lucky for us, the Napa craft beer scene is continuously growing. The city of Napa is now home to nearly ten breweries all with a distinct style and atmosphere. From urban nano breweries to larger brew houses like Stone Brewery, Napa has a nice mix that will have you coming back for more. In addition to the breweries, Napa houses several brew pubs where you can catch a game, enjoy an outdoor beer garden, or simply hang out and feel welcomed like a local. Or, interested in a unique beer experience? Napa has you covered there as well. So whether your a local and needing a place to hang out or a tourist looking for something different to do, the Napa craft beer scene has you covered. Here is a look at what Napa has to offer all you craft beer lovers…. One of our favorites is the urban nano brewery St. Clair Brown Winery & Brewery. This location is unique for a few things. First, it is the only winery/brewery in Napa Valley. Second, the two female owners have interesting and impressive backgrounds. Both have extensive experience in the Napa Valley wine business, and one is the only female winemaker/master brewer in the US. And finally, the outdoor culinary garden in the middle of the industrial section of Napa makes the atmosphere unlike any other in the city. Added bonus, the rotating small batch craft beer is amazing! The newest local Napa brewery is Trade Brewery. Trade Brewery prides itself on breaking the mold by using unique methods, ingredients, and knowledge of the trade. They aim to bring craft beer to Napa in a new way. With craft as their trade and beer as their passion, you can’t go wrong with a stop by this local joint. And it’s location on First St. in the heart of downtown, makes this a must do if you are staying or visiting the city. Napa Palisades Beer Company is a more established local brewery and one that is about to get a whole lot bigger. This craft brew company currently operates the Napa Palisades Saloon at the corner of Main and First streets in downtown Napa. They serve great local craft beers featuring their own as well as many guests taps. Coming soon, the company plans to create a multi-million-dollar craft brewery, beer tasting room and beer distribution center. This new space at 807 Soscol Ave. will allow Palisades to do a lot more beers and more varieties once they have the room. There are several places to grab a beer in Napa, but there are a few that really stand out for their great craft beer and truly Napan experience. First you have one of Napa’s newest locations, Tannery Bend Beerworks. Whether you are just getting off work or need to watch a World Cup match at 7AM, this is the place to go. And while they serve a lot of their own craft beer, they also serve a lot of food. You can enjoy lunch, dinner or a lot of snacks, too. Do you like to drink great craft beer outside? So do we, and we love to do it at the outdoor beer garden at Hop Creek Pub. Here guests can indulge in unique craft beers, a locally sourced menu and great spirits and wine all while enjoying the California sun. Overall, Hop Creek Pub aims to provide locals an experience built around a welcoming warm atmosphere. Want to do more than just drink a pint of great Napa craft beer? The city has plenty of options for you. First, you can join Paper Napan Walkabouts to explore the city like a local. Our unique Napa walking tours are the first to feature both local craft beer and amazing Napa Valley wine. Plus, you will explore a unique side of Napa not often scene in traditional Napa Valley tours. Second, want to learn how to make great craft beer like a pro? St. Clair Brown recently hosted their first Beer Boot Camp. Here, participants spend the day brewing a batch of beer with their Brewmaster and learn both the art of crafting world class beer and the nuances of food and beer pairing. They open their brewery up twice a year for this ultimate beer experience. Third, want to taste great Napa craft beer and still get the up valley experience? Napa Valley Wine Train has you cover. That’s right, the Wine Train has hopped on board the growing craft beer trend and partnered with Palisades Beer Company to create Napa’s first Hop Train. Guests can enjoy a local craft brew, a refreshing Open Air car, and tasty bites. It’s definitely a unique way to savor your way through wine country. And finally, six of Napa’s local breweries have come together to create the first Napa Beer Mile. Beer lovers can enjoy discounts at all six breweries on February 9, 2019. And for those that make it to all six, these warriors get to collect a commemorative cap to wear proudly. You can purchase tickets in advance at here or collect on the day of at St. Clair Brown. Whether you love a great craft beer along with your world class wine, or want to please a group with mixed tastes, Napa has you covered. It is certainly a logical progression for California’s premier wine destination to move into a premier craft beer destination as well. 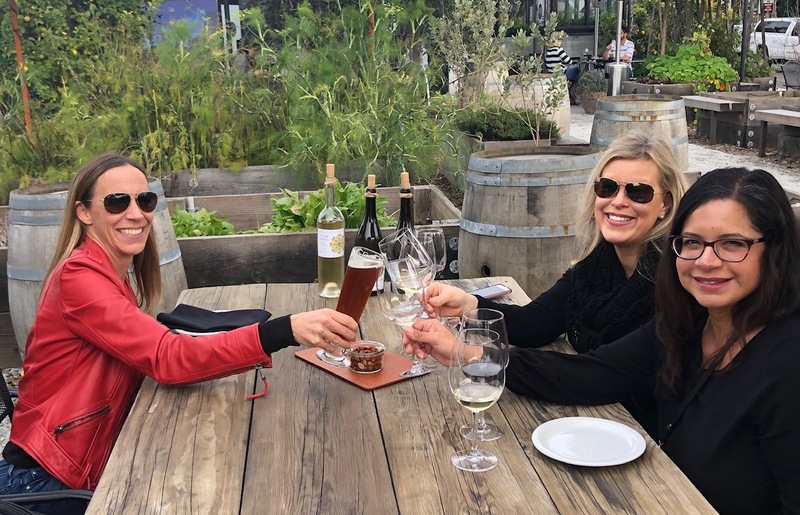 As one of America’s favorite adult playgrounds, it is great to see Napa expand into a variety of amazing local libations. Older What’s a Walkabout Anyway? Many people have asked, and we have listened. What does a walkabout mean? The answer is simple...kind of.